Why did you need/want a Google Sites consultant? 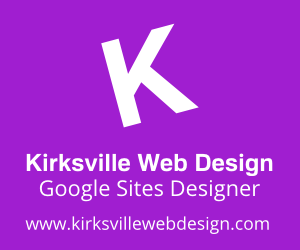 What’s it been like working with Kirksville Web Design? We wanted a Google Sites consultant/partner to increase our knowledge expertise and efficiency. Kyle is 100% focused on Google Sites. Since partnering with Kyle the Great we have been able to bounce ideas off of each other and come up with creative solutions and designs for Sites. Simply put, partnering with Kirksville Web Design and working with Kyle has been awesome and beneficial for our clients. We’ve had a couple of great projects together, what were those like from your perspective? Yes we have! What always amazes me about you is the efficiency at which you work. We have actually had clients say they were happy and surprised with the amount of time it took. Your visual creativity for sites adds alot of value, it’s always important for sites to have good content, but the display is also important and contributes to the engagement of users. Our working relationship is excellent, we often call you with a complex and large project, give you some info and you say you’re ready to go. Within a few days we see a protoype, love it, and move forward to get a finished product. From my perspective, your work with Google Sites is largely beneficial. How do you intend to advertise Google Sites in the future? How will you market Google Sites in your proposals for deployment? We advertise Google Sites as a hidden value in the Google Apps for Business suite of tools. People often think Gmail is all they’re getting when they pay $50/user/year, then they start diving into the product and realize all the benefits. I try to help companies realize the continuous value proposition of their new engagement in Google Apps. We market the ability to create and host intranets, websites, workflows, document repositories, etc. What demographics do you target for Google Sites services? We are heavily focused on mid-market companies and utilizing sites for intranets, websites and workflows. We also have clients in the educational space who are utilizing Google Sites in classrooms and raising a generation on Google Apps! What have been the benefits to your company and your clients? If I haven’t made it clear yet, this is a win-win-win partnership. Our clients benefit from leveraging the Google Apps platform, Cloudbakers benefits by bringing them phenomenal cloud solutions, and Kirksville Web Design benefits by displaying their expertise in every project. Thanks a ton for the interview Andrew! Make sure you're choosing social networking to promote your online business. Making it possible for people to follow updates and find more information about you by means of Facebook or myspace, Twitter, and other sites will increase the chances of you them becoming customers. Plus, if one customer "likes" your web site on Facebook or twitter, their contacts could see it and check out your business too. Great post, your efforts are much appreciated. It’s really a great and helpful piece of info. I’m happy that you shared this useful info with us. Very lucky Kirksville! Many have been eyeing to be part of Google's company (even to visit their office is an extreme opportunity right?) and you guys are awesome. Even dropshipping companies are coping with Google to be able to get a single chance for a catalog through Google worldwide. Google is a model of simplicity combining with the best functionality. It is a feat that is difficult to achieve. Giving the user that best user user experience possible, easy to comprehend and the most important part, does the job well. Hiring a google site consultant can increase one’s knowledge and can give more techniques in online marketing field. There’s nothing wrong with it as long as you contact the most credible persons in that field.